Senior infielder, relief pitcher Noah Martinez just moved back to Sharon, Massachusetts from Cary, North Carolina after living there for three year and a half years, and he is making his presence known in a big way. After getting cut in his junior year of high school, he worked his hardest to make sure it never happened again. His brother Levi, and his dad Antonino who was a minor league prospect for the Philadelphia Phillies and the St. Louis Cardinals pushed him to become a better player. Now all of that work from the past year has paid off as in the past two scrimmages, he has hit two home runs against the Dover-Sherborn High School Raiders, one on Saturday March 30th and the other on Monday April 1st. “It felt very, very good,” Martinez said. “And there is going to be many more to come,” he added. His baseball teammates are very happy to have him on the team. “It is definitely great to have a kid like Noah on the team,” said junior infielder and relief pitcher Jack Zinman. “I feel that something that Sharon has been lacking for the past couple of years is just a power hitter that can consistently do it and seeing Noah hit in person is just unbelievable,” he added. He was very impressed about Monday’s home run in particular, “The home run that he hit on Monday, from the second he made contact with it, it was gone,” Zinman said. “I think he will be a tremendous hitter on our team,” said senior outfielder Dariel Martinez. “I think he is going to score runs for us early on and we are going to pull through with him in the field,” he added. 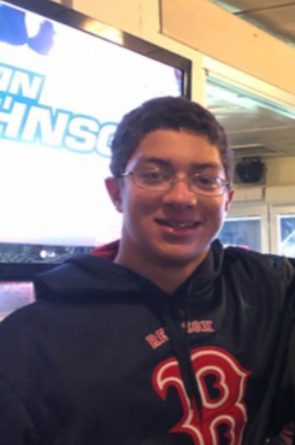 Junior varsity sophomore outfielder Damien Bonner, who played in the first varsity scrimmage against the Canton High School Bulldogs said that Noah is a good person to look up to, “I think I can learn from his hitting and he is a really great player on the field” he said. Noah could be very reliable for the Eagles’ chances in the Massachusetts Interscholastic Athletic Association playoffs, “He is definitely going to help us make a playoff push this year,” Zinman said. The Sharon High School Eagles baseball team will play their first regular season game at home on the baseball field against the Milford High School Scarlet Hawks on Thursday April 4 at 3:45 p.m, who will also be playing their first game of the season. Sharon split the season series in a doubleheader in Milford, Massachusetts.